Stenosis in the thoracic spine is not a common symptomatic condition, but it is certainly possible to experience due to spontaneous injury, or less likely, vertebral column degeneration. Spinal canal narrowing is far less prevalent in the thoracic spine, but since the upper back works so closely with the anatomy of the neck, cervical spinal stenosis conditions might express themselves partially or almost in totality in the upper back region, particularly in between the shoulder blades or at the cervicothoracic juncture. Statistically, the thoracic region is the least commonly affected by any structural abnormality and is unlikely to suffer the incidence of injury or spinal canal deterioration inherent to the neck and low back areas. 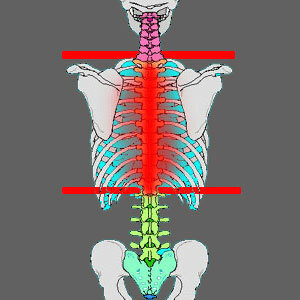 This narrative provides lesser known facts about thoracic spinal stenosis. 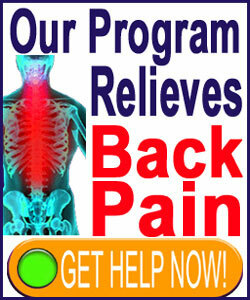 Upper back pain, just like any other type of back ache, may or may not be related to the stenotic change. Most minor and moderate stenosis anywhere in the spine will not cause pain, nor will it source any other problematic nerve symptoms. Substantial stenosis is likely to create pain or other related neurological effects, and these can occur almost anywhere beneath the affected spinal levels. The upper back is very durable and the spinal canal there is not subject to the same degenerative processes imposed on the lumbar and cervical regions. It is for this reason that the majority of actual stenosis upper back pain conditions are likely to be related to a cervical canal issue than a thoracic one, except if known trauma has befallen the upper back in the past or an extreme congenital or developmental structural issue exists. Many patients demonstrate minor central stenosis in the upper thoracic levels, due to a herniated disc or spinal osteoarthritic condition. However, these mild changes are highly unlikely to be the cause behind their suffering. In some circumstances, there is obvious or not so obvious lateral recess stenosis or foraminal stenosis pinching a nerve and causing the specific pattern of pain experienced in the upper back. These conditions are often overlooked, but can usually be treated successfully once diagnosed properly. Symptomatic correlation with a neurologist is crucial to fully understand the relationship between upper back pain and possible compressive neuropathies in the lower cervical and upper thoracic spinal levels. To further complicate matters, nerve symptoms can also be generated locally in the thoracic area from purely nonspinal causations. Ischemia is always a possible source of symptoms anywhere in the anatomy. Meanwhile, thoracic outlet syndrome is a location-specific muscular interaction with the nerves or regional blood supply which can cause pain and related nerve symptoms, like weakness and numbness. These conditions are rarely considered by medical traditionalists and may therefore elude positive diagnosis for a very long time indeed. We correspond with a great number of patients who have mild and even moderate cervical stenosis which has been blamed for causing upper back pain. In a few cases, there may be some validity to the diagnostic theory, but in most, misdiagnosis seems likely, based on our own research and experience with thoracic symptoms, the patient’s imaging results, the patient’s non-correlating symptomatic expression and the latest professional medical research. When advised to seek a second opinion, the new diagnostic evaluation typically confirms the stenosis as coincidental in virtually all instances. Many upper back issues, particularly those involving the arm or shoulder, are muscular in nature and not spinally motivated. Dr. John E. Sarno writes about the vast variety of muscular pain conditions and how most of these chronic concerns are linked to the mindbody process. I find this theory to be far more plausible, particularly when symptoms do not seem to make sense for a stenosis diagnosis. At least there is no risk in investigating this possibility and the cure might be easier to enact than suffering through unnecessary surgery for a condition which may not even be the true source of pain. For patients with actual central stenosis which is definitively symptom-producing in the thoracic region, there is good news. Of all central canal narrowing issues, the thoracic region responds best to appropriate treatment, including spinal stenosis surgery when truly needed.